The Natural History Museum in London has just announced the winners of their Wildlife Photographer of the Year competition. 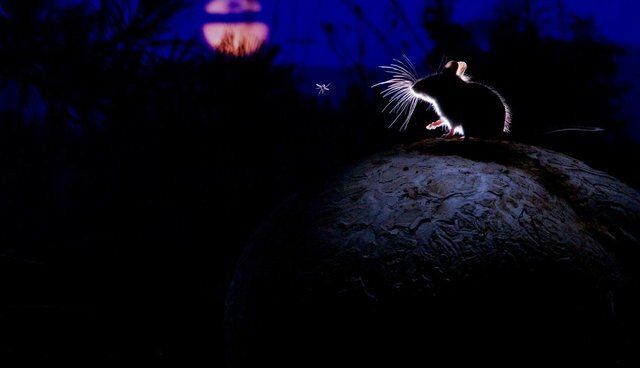 The mammal category goes to Alex Badyaev for his stunning picture of a deer mouse and a mosquito backlit by the moon. Badyaev is an evolutionary biologist, and like numerous scientists and naturalists who have preceded him, the art and the science go hand in hand. "My career as a scientist and a nature photographer gives me a way to learn and convey the fascinating complexity and diversity of the biological world," he told BBC Wildlife, after winning an earlier photography award-a list of prizes he's received that keeps growing. "I have always spent a long time observing animals. That's when I think, get inspired, learn, come up with my best scientific ideas," he said. For centuries wildlife artists with their closely observed, highly detailed illustrations informed us humans of the natural world, much of which was out of reach and out of sight. Before John James Audubon painted portraits of birds as well as quadrupeds, there was Maria Sibylla Merian, at the turn of the 18th century, traipsing through the Dutch colony of Surinam, capturing in brilliant colors insects' metamorphoses. And before her there was Leonardo da Vinci, filling his notebooks with studies of wild cats and crabs, feathers and wings. The camera's invention, however, was a boon to the animals; they no longer had to die and be stuffed in order for their likenesses to be rendered. Badyaev was hiking through Montana's Blackfoot Valley when he came across a giant puffball-an amazing mushroom that can inflate to more than a foot in diameter-which piqued the curiosity of a coterie of small animals. Running across the mushroom's surface, the chipmunks and squirrels, like ancient travelers, made hieroglyphs with their tiny toes. The photographer lay on the ground, observing the nocturnal activity, patiently waiting for the right moment. In an email he said that although he was in the midst of another research project, which included photographing mountain lions and beavers, "It was just hard to resist the combination of inquisitive mice, full moon and a giant mushroom that looked like a planet surface when a mouse stood on it." One deer mouse hesitated. A mosquito had caught his attention. In an instant, an ephemeral, faraway moment was captured for the world to see. BBC Wildlife, July 21, 2011, Alex Badyaev's website. Interview with Neil Losin, "Meet Biologist/ Photographer Alex Badyaev," October 2011. London, England, Natural History Museum, "Wildlife Photographer of the Year 2014." Email with photographer. Reposted from the author's blog Mouse Interrupted.